If you've ever had the challenge of identifying a type of composite decking on site, to know what fixing to use, you'll be interested in our handy guide! From our experience of site visits and questions put to our customer services team, we understand the challenges of using decking profiles to install services and can offer advice. However, the main challenge is often that the sub-contractors on site won’t always know which type of decking they are working with. How to identify the decking, if the manufacturer is not known or the profile is unfamiliar a lot of time can be wasted trying to correctly identify the type of decking. Even if the manufacturer is known, the quality of information available can differ between manufacturers. Any technical specifications that are provided will tend to focus on the installation of the decking itself rather than the information sub-contractors need, about which fixings to use. Unless the main contractor has stipulated the decking type, which has filtered through to the sub-contractors, they can often be left looking at a steel decking profile with no obvious branding to help them distinguish which type it is. This makes it difficult to know which fixings are compatible without further advice. So, having come across this query a lot we decided to undertake some research on the common types of composite decking and how to differentiate between them. As well as identifying which fixings can be used to fit their particular channel recess and suspend building services from. Check out our handy Decking Identification Guide to distinguish which type of decking has been used on site and the relevant fixings to suit. We gathered information from manufacturers of the main decking types and the various fixings, contacting them where required for clarification and obtaining any missing data. This has allowed us to collate all the information necessary to identify a type of decking used on site and its required fixings. The guide is split into two sections the first to identify the type of decking used the second on the types of fixings. Each section is cross referenced to make it easy to navigate. Plus, for easy ordering we’ve included the stock codes for the relevant fixings so you’ll have all the information you need to get on with your project. 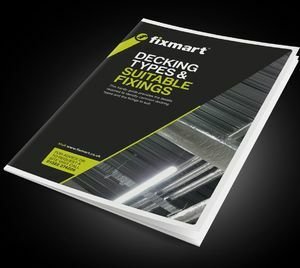 Although the guide is very comprehensive if you have any queries please contact our team on 01322 274226 or sales@fixmart.co.uk to discuss your specific needs. We can also arrange site visits to suggest a fixing solution for your specific project, or our Account Managers can provide on-site training and tool box talks if required. Alternatively if you already know which fixings you need click here to view our full range of decking fixings.